Welcome to my Bridge Lesson site. You have my permission to use any of my materials in your Bridge classes, just credit me. My previous site had forums but I have removed those for lack of use by any but spammers. I will publish some of the useful posts from the old site someday soon. You are welcome to leave comments on this page if you want to discuss teaching bridge. Materials and Lesson plans for teaching Bridge to children, also known as the Schools Bridge Lesson Program, are in the various Download areas for teachers. These are free and you do not need to sign up. The ACBL has the most current manual for teaching kids on their site. You can contact me to get pre-analyzed Hands for a Schools Competition. I have two sets of 12 pre-analyzed hands which we used in our competitions. Most were originally played in a Novice game at a regional or in the Culbertson Bridge club in NYC, first by the regular game then in the novice game. The matchpoints are included in the brief write-up. Finally the ACBL Education foundation sponsors bridge classes in the schools. Click here for more information from the ACBL. I am living in Iran,Iplayed bridge before 1979 with Mr. Charles Goren’s rule,and now I play Bridge Baron by my tablet. 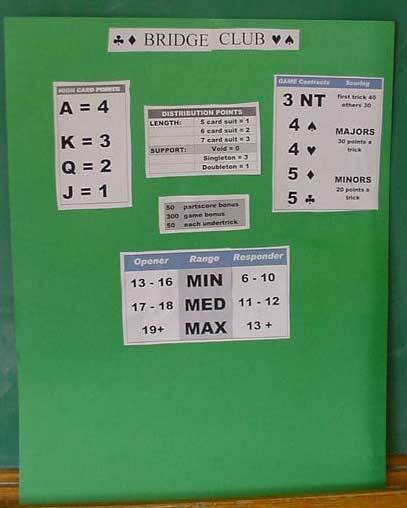 I am very interest to know new rules in Bridge.May I ask you help me in this subject. Well welcome back to a wonderful game, sorry not to have responded sooner but I was travelling and mainly offline. The bidding summaries on my own site here are very basic and for beginners. See my book section on this site for more ideas. Sorry Jaqueline, not my area of expertise. The game of bridge is its own reward, it is a fun way to exercise the brain and learn critical thinking (sadly missing in many schools). i have been teaching bridge for adults for the past 10 years. though a lot of my students have learnt the games but there is very little improvement in their ability to play hands or defend despite my giving them constant exercises on both these topics. could you suggest some way of ensuring that they improve. bidding seems to be ok.